I wanted to approximately evaluate the amount of energy generated by a solar panel at a given direction by using light intensity values produced by photo-resistors. Solar panels generate a high amount of energy under high solar radiation relative to the light intensity which is why I intended to use light intensity levels as indicators assigned to led colors – red, yellow and green. In other words, this project is for predicting the amount of energy generated by a solar panel between three light intensity thresholds, and also notifies you when the high threshold exceeded. [ E = A * r * H * PR ] is the formula for calculating the generated energy by a solar panel, where A is the area of the solar panel, r is the efficiency, H is the average solar radiation and PR is the performance ratio or coefficient( usually 0.75). You can change all solar panel values at the code below. You can find a detailed connections guide at the code below. Connect led, photo-resistor and GND wire to a mini breadboard. 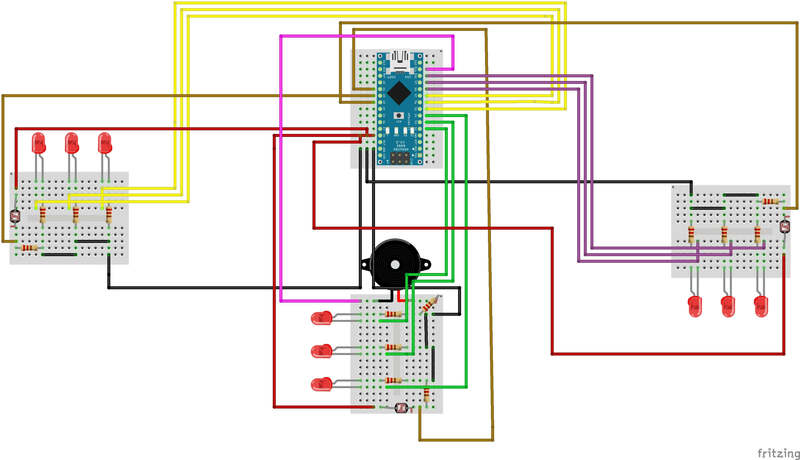 And, connect buzzer to control_1 mini breadboard. 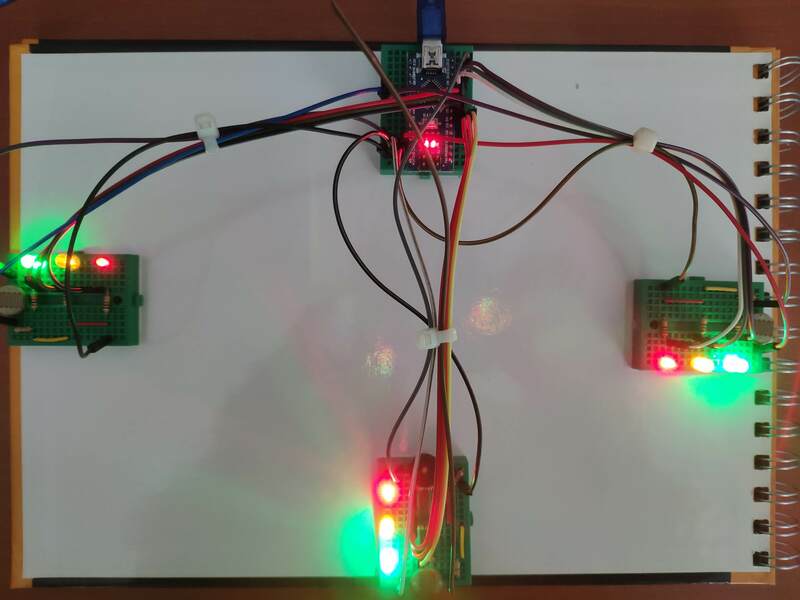 Make the connections between all mini breadboards, and it is ready to detect light intensity. Also, if you want, get the output through serial ports. Now, you can use it to charge your Li-Po battery properly via a solar panel. // This project is for predicting the amount of energy generated by a solar panel under the light intensity level given by photoresistors which are placed in three different directions. // The amount of energy generated by a solar panel is related to the amount of solar radiation which is why I used the light intensity level as an indicator to evaluate it approximately. // You can define threshold values below. // Define control leds as indicators. // Define Ldr analog pins to calculate solar panel energy and light intensity. // Define the buzzer pin. // Define solar panel variables emphasized by the guide. Do not forget to change them. // Define threshold values(low, moderate). // Define variables to collect light intensity data. // Initial the indicators at three different directions. // Gather light intensity data from photoresistors each placed in a particular direction. // Calculate the energy level of a solar panel approximately by assigning radiation levels to light intensity levels. // Adjust the range of the indicators according to the amount of the energy generated by a solar panel. And, get notified when the high threshold exceeded. // Write which control ldr gathers data.